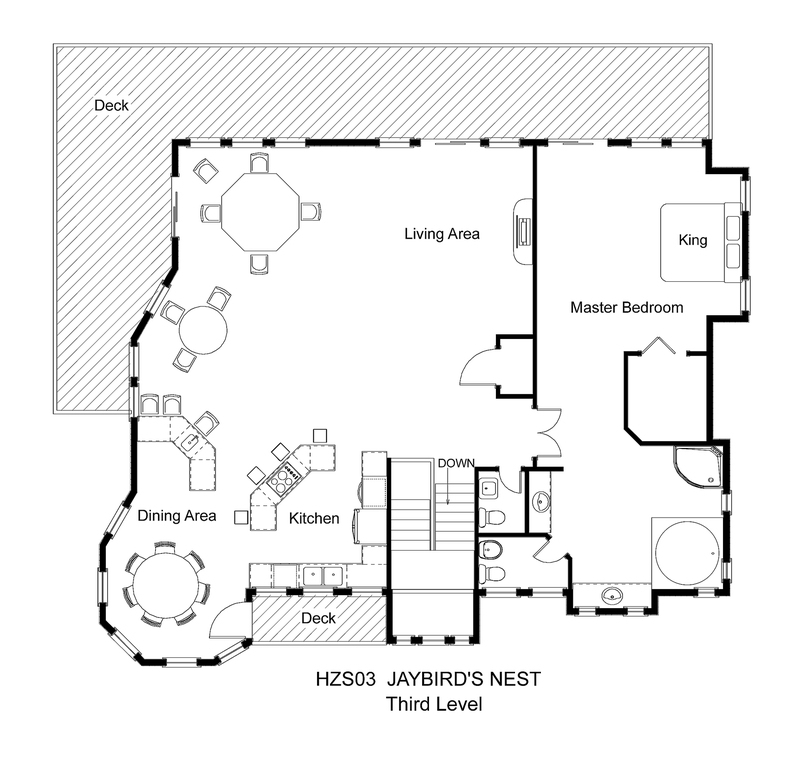 Settle into Jaybird’s Nest for your next Hatteras Island vacation. Watch the ferries come in from all three levels. From the start, your vacation will be a breeze with an elevator to help carry your luggage and groceries to all floors. Enter through the enclosed garage onto the ground level game room with TV. Shoot some pool or try your hand a game of air hockey. A wet bar with full-size refrigerator and microwave is ideal for poolside treats and midnight snacks. A bedroom with two double beds and access to the covered patio opens onto a semi-private bath with shower stall. Soak in the hot tub on the covered patio while enjoying a breathtaking sunset. An additional bonus room on this level has a single bed. All bedrooms throughout the home have TVs. Four additional bedrooms are on the middle level, each with access to the covered wraparound deck with stairs down to the pool area and stunning sound views. 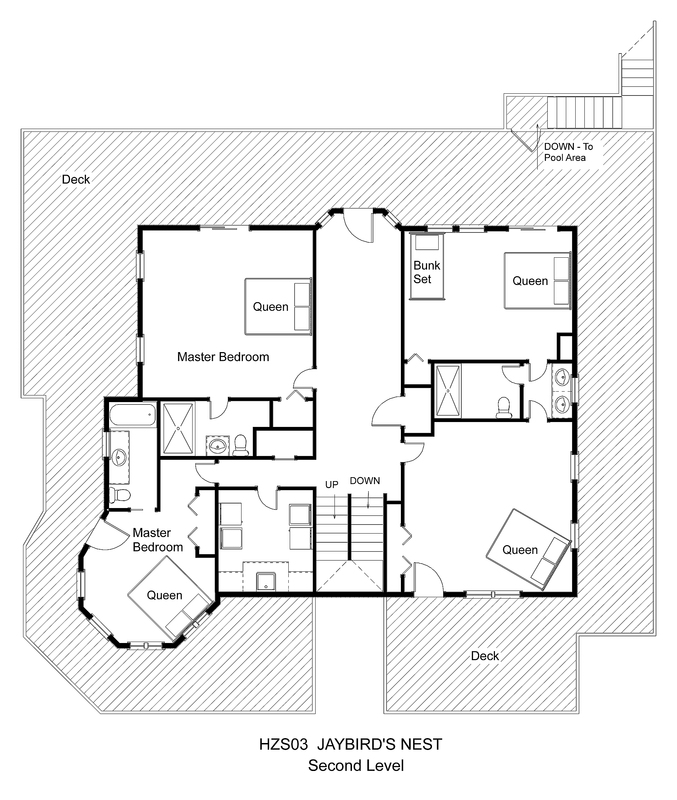 Two queen master bedrooms, one with shower stall in the bedroom, are off one side of the central sitting area. 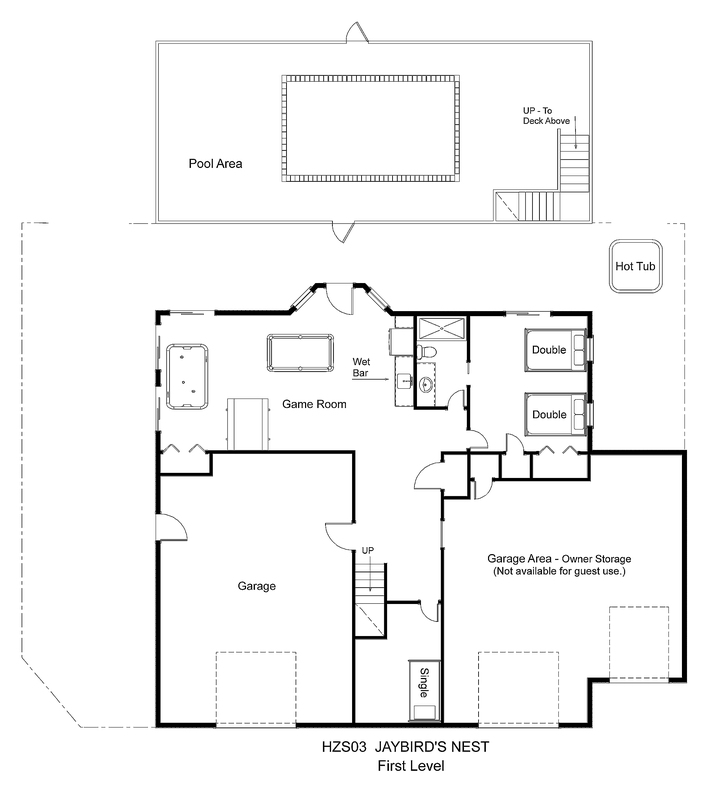 A third queen bedroom and a bedroom with a queen bed and a bunk set share a Jack-and-Jill bath with shower stall on the other side of the sitting area. Also on this level is the laundry room with dual washers and dryers, sink, and counter space for folding. Cathedral ceilings and large windows bathe you in natural light on the top floor, the main living area of the home. Gather around the dining table to dig into a tasty seafood feast whipped up in the custom kitchen. Cozy up beside the fireplace from November-May and enjoy a movie in surround sound from one of the many available movie channels or cheer on your favorite team with NFL Sunday Ticket. You will feel like the king of your castle in the huge king master suite with spacious private bath featuring Jacuzzi tub and separate custom shower. With both shaded and sundecks on this level, you can feast your eyes on the sights of Hatteras Village in comfort. Splash and play in the in-ground pool with heat available or soak up some sun on the paved pool deck. The large landscaped yard is great for kids of all ages to enjoy some outdoor fun. Steps down to the water make this the perfect place for the watersports enthusiast. From this fantastic home, you are just a short distance from any adventure you seek. Take the ferry for a day trip to Ocracoke, spend a day charter fishing in the Pamlico Sound or off-sore in the Gulf Stream, or indulge in some of the best shopping and dining Hatteras Island has to offer. At Jaybird’s Nest, you can’t go wrong! Note: Only one bay of garage is available for guest use. Are the quoted rates the total for the entire week or per night? It depends on what dates you are putting in, but it tells you the date range just above the quote. So for example, if it says "Sat Jul 7 - Sat Jul 14, 2018", the quoted price below it is the price for the entire week, not a nightly rate. For the 2018 season, Jaybird's Nest is not part of the pet-friendly program. Home was absolutely beautiful! perfect in every way. The view is stunning from every window!! You will not see a prettier sunset! I would absolutely recommend renting a kayak or paddle board from Ocean Atlantic Rentals. And charter a boat for inland and/or offshore. We had seafood to spare, even after giving a bunch to the crew. The house is nicely laid out for an extended family. We were myself, my husband, my brother and his wife, and my sister, with six &#34;kids,&#34; aged 18 - 28. They look forward to vacationing with their cousins every year.